"Professional organizer Nikki Boyd has a gift of transforming a space into a captivating work of art. She sprinkles a little bit of glam and a whole lot of functionality into every space she touches." "It is my belief that an organized home guarantees a beautiful and fulfilling life." With her keen eye for detail and trademark warmth, Nikki guides readers through these steps, teaching how to graciously share your homes with family and friends to create treasured shared experiences and memories. 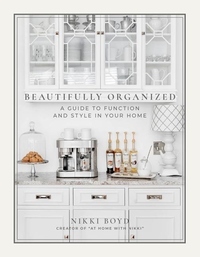 Beautifully Organized is so much more than a home organization book--it's a recipe for a beautiful, fulfilling life.